1968 was a year of protest in civil society (Prague, Paris, Chicago) and a year of protest in sport. After a world-wide campaign, the anti-apartheid movement succeeded in barring South Africa from the Olympic Games, while US athletes from the Olympic Project for Human Rights used the medals podium to decry the racism of North America. Meanwhile, students in Mexico demonstrated against social priorities in Mexico, the host of the 1968 Games. These events contributed significantly to the rejection of the idea that sports are apolitical, and stimulated the scholarly study of sport across the social sciences. Leading up to the Beijing Olympic Games, similar dynamics were played out across the globe, while a campaign was underway to boycott the ‘Genocide Olympics’. The volume, To Remember is to Resist, came out of a three-day conference on sports, human rights and social change hosted by the University of Toronto forty years after Mexico and eighty days before the Beijing Opening Ceremony. 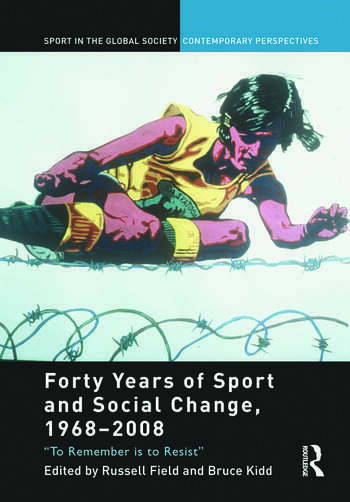 The contributions to this volume capture the memories of activists who were "on the ground" using sport as a site for the struggle for human rights and provide scholarly examinations of past and current human rights movements in sport. Russell Field is an assistant professor in the Faculty of Kinesiology and Recreation Management at the University of Manitoba, whose current research examines the contested meanings of global sporting events. Bruce Kidd is currently Dean of the Faculty of Physical Education and Health at the University of Toronto. During more than forty years, Kidd has combined careers as an internationally ranked athlete, coach, sports administrator, professor and dean with critical scholarly and popular writing about sport, often on the issues in which he has been directly involved.